Every year some 2.9 trillion pounds of food—about a third of all that the world produces—never gets consumed. It's enough to feed the nearly 800 million people worldwide, who suffer from hunger, more than twice over, according to the Food and Agriculture Organization of the United Nations. Losses in the food system occur throughout the supply chain. Food is lost on farms; during processing, distribution, and storage; in retail stores and food service operations; and in households for a variety of reasons at each stage, according to an NRDC report. Included in this American food waste problem are some six billion pounds of produce that go largely unharvested or unsold largely for aesthetic reasons, on an annual basis. These scarred vegetables are regularly abandoned in the field to save the expense and labor involved in harvest. Or harvested and remain unsold, and then left to rot in landfills because of minor blemishes that do not necessarily affect freshness or quality. These outcasts are being called "ugly produce" or "imperfect produce" by the media - or produce that is deformed, wonky, crooked, or misshapen. We’re not talking about “rotten produce” or that which is spoiled, moldy, or so inedible as to make someone ill.
A major reason is that food is cheaper in the United States than nearly anywhere else in the world, aided (controversially) by subsidies to corn, wheat, milk, and soybeans. But the great American squandering of produce appears to be a cultural dynamic as well, enabled in large part by a national “cult of perfection”, deepening hunger and poverty, and inflicting a heavy toll on the environment. In the United States, we have the long-time Department of Agriculture USDA Grades and Standards for Fruits and Vegetables in place since 1945. It provides the fruit, vegetable and specialty crop growers and buyers with an exacting language for describing the quality and condition of produce to be sold - specifying the exact color, size, and quality of the perfect produce - defining US No. 1 Produce, as the premium, versus US No. 2, and all others, as lesser quality - although in some states, produce sold at farmers' markets is exempt. These standards are essentially market driven - ie: the perfect produce that we see in stores. These grades are an outgrowth of the widely accepted principle that price should be directly proportional to quality, with US No 1 demanding the highest market price. It is the principal that the grower who delivers high quality produce deserves a premium price because such produce enable the processor to pack a better quality finished product. (The standards are also used for mediating disputes.) Although these standards are called voluntary, produce not meeting those standards gets rejected and wasted, or used in other industries. When US No 1 produce hits the store shelves and restaurants, the largest portion of American food waste occurs at this late stage in the supply chain. It's because produce is particularly prone to spoil, and even if it has one bad brown spot, we simply throw it out. It's because of our prevailing cultural beliefs of perfection, lack of education about produce and food handling and storage, buying too much, serving huge portions of food we can't eat, and because of our learned behavior of easily throwing out what we simply don't want because we can easily get more (food is abundance and relatively cheap). Plus, there aren't many visible and easily outlets and public solutions to handle cast-off food products to be recycled. There are also no visible penalties for wasting food - a garbage truck simply takes it away - ugly waste is hidden from sight - it just goes away somewhere. ​Until now. Some of us are bringing awareness to the problems this ugly waste is causing our planet and us. 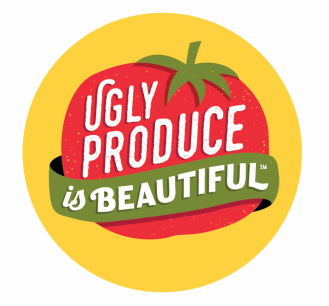 ​Through this website and @UglyProduceIsBeautiful Instagram, we hope to encourage you to buy and cook with ugly produce, and to build a community - a community of those of us who feel passionate about changing the ways American's think about ugly produce - that it's actually beautiful, nutritious, and can be used in recipes - and, in turn, to help prevent so much food waste. We also hope, through our www.CraftyBaking.com website, that we can educate you about ways to use and store produce at home, to help eliminate so much food waste. We also have recipes to share on that site, with tips on how to cook and bake with produce. It's not too late to invoke change in the way we eat and how we eat, and what and where we buy. Ask your local grocer to bring in more ugly produce to sell at a discount. Educate yourself about this Ugly Produce Problem and how devastating it is to our planet in terms of waste and pollution. Write your local or state government calling for change. But more importantly: Actions speak louder than words! Put your money where your mouth is! Money talks, so spend your produce dollars at your local Farmers' Market and buy ugly produce! Others will take notice! Some ugly produce solutions are being utilized: unharvested produce is being "gleaned" or gathered in the fields, and it, as well as aged produce, is being sold at a discount or donated to food banks or charities. Some of it is being used in modern food products. Farmers by nature aren't wasters and they feed ugly produce to livestock, cook with it, and give it away, or sell it at farmers' markets. As the the Nation's highways were being built after World War II, suburbs, or enclaves removed from city life emerged. Larger homes could be built with fancy kitchens. This was also the beginnings of the "Baby Boom" years, a rapid growth of America's population. As American's moved farther from their homegrown food source and daily shopping rituals, better refrigerator and food storage, became available. Supermarkets in the suburbs were being built in America, estimated at 3 a day at one point, becoming the central markets to go to for food for growing families. Food factories were being built, and food handling machinery was invented to handle the increased need for food and its storage. The new highways allowed for the better distribution of this food away from its growing source, in which the old farming system was deemed to be inefficient to handle the demand of the growing population. I believe, that food made or sorted in factories, had to become more uniform in size and shape to be sorted, frozen, and packed, because of industrial machinery. Then American food companies had to sell the idea of this new food to the American public through Madison Avenue or advertising. At the same time, new American messages of keeping a clean and spotless house and having a perfect family and marriage were being sold to us by Madison Avenue. Dirt was bad; a clean house was the way to go - germs were bad - let's spray away all of the germs with new cleaning supplies. We should all live in cookie cutter homes and have cookie cutter kids with everyone smiling. Even our produce and food should be cookie cutter and look the same and be perfect - just like TV dinners were and have evenly sized canned or frozen produce that comes in one color. Kids toys were perfect - Barbie and Ken were cultural images of how perfect adults should look. Plus, we could become a disposable society- we could also throw away all of our unwanted waste and food in the garbage - discard the TV dinner pans, cans that the food came in, the grocery bags we were given at the new supermarkets, and endless colorful bags and packaging. And it disappeared somewhere or was picked up by garbage trucks, disposed of sight unseen, keeping our homes neat and tidy. Even dirt that was vacuumed in the home could be disposed of in the garbage in a vacuum bag, rather than throwing it out the door into the yard where it belonged. 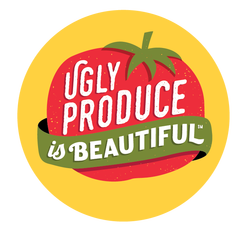 We believe that the ugly produce problem began at this time along with all of the other cultural messages at the time - discarding produce that doesn't fit the perfect image of what American's should be eating - that it should be perfect and clean. We think the problem grew because we just bought into America's messages about the American Dream. That's all. It's because we wanted to and because we had to - there weren't many choices not to. We felt that we were being progressive and it felt good - the convenience of it all. Environmental causes are cited for the reasons produce can grow into ugly and unusual shapes. Though the produce is still nutritionally identical to more regularly shaped specimens, things such as too much fertilizer or too little, or for example, with carrots, if the tip is damaged by growing and hitting a rock in the soil, it can sometimes split, forming multiple roots attached at one point. Or, some carrots can be strange shapes because young carrot roots can go off in odd directions, drawn by irregular pockets of manured soil. Fruit can become blemished because of bad weather, and it's often rejected. ​Apples can become ugly from a hail storm, high winds or even a string of very hot sunny days. This can damage the exterior skin of fruits. While the texture and flavor remain perfect, the exterior damage usually renders these fruits unsellable in the fresh market because they fail to meet traditional grade standards. Produce can become easily blemished at the grocery store, from too much handling. Stores buy and display too much, to show abundance. The science of effective produce selling dictates that people want to see abundance before they buy. We touch and smell produce to make sure it's firm and fresh before buying. This, in fact, causes produce to blemish, bruise, and causes soft spots, because we pinch and poke it in the process, accidentally drop it on the floor, place in it in the bottom of the cart, and then change our minds, etc Aferall, the produce section are the first aisles we typically see in the supermarket, so the produce is bound to be at the bottom of the cart - it's because it's a known retail sales strategy to see fresh food first. (SARAH SAYS: Redesign the carts, someone. DUH!) By the time the produce gets home, it's already on its way to becoming ugly!